In the 1940s concerns about the neglect and erosion Ontario’s natural resources became a focal point by agricultural, naturalist and sportsmen’s groups. Accordingly, in 1946 the Conservation Authorities Act was established by the provincial government in collaboration with several municipal councils. After the devastating impact of Hurricane Hazel in 1954 in Ontario, where thousands of people became homeless and 81 people died, these conservation authorities took on a greater role in long-term flood prevention that even today is reaping the benefits. The following is a brief interview with Terry Murphy, General Manager of the Quinte Conservation Authority. “Quinte Conservation Authority was formed 70 years ago when a group of concerned residents got together in someone’s living room and discussed ways to lobby their municipality with the plan to establish what is now Quinte Conservation. This organization is one of 36 Conservation Authorities across the province of Ontario. All 36 authorities have a primary mandate of flood forecasting, flood reduction and water management. “Over these years Quinte Conservation has built up working relationships with several environmental and landowner associations and all of our 18 municipalities along the Napanee River, Salmon River and Moira River watersheds and in Prince Edward County. We have undertaken floodplain mapping with the intention of preventing loss of property and life due to increased water levels from storms and winter run off. “Recently the impact of climate change has increased the workload on the conservation authorities. Managing natural hazards from one extreme to the other has become a challenge. The drought in southern Ontario during the summer of 2016 contrasted the high water levels and flooding around Lake Ontario and its tributaries in the spring and summer of 2017. Conservation Authorities in Ontario have a broad mandate to oversee such programs as flood forecasting and warning, floodplain management and mapping, infrastructure and planning services, private stewardship such as reforestation, water quality improvement, and the creation of windbreaks and shelter belts. What makes up our Watersheds? 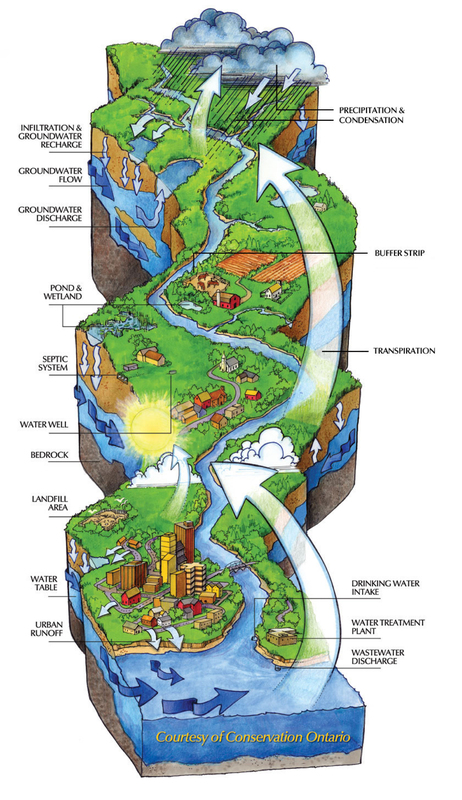 A watershed is an area of land over which rain and melted snow drain into a water body such as creek, river or lake. Watersheds support our lives and our lives affect our watersheds. Being conscious when using this natural resource enables one to connect with the water element from a place of respect and gratitude. The average Canadian household uses over 500,000 liters of water per year, with some estimates showing at least 50% of water use is unnecessary and wasteful. Addendum: During the hurricane season of 2017, there have been several category 4 hurricanes moving across the Carribean and causing extensive destruction and death on the islands as well as on Cuba and mainland USA. Millions of people are beginning the slow process of recovery. They are dealing with loss of electricity, no food or water and no housing. With difficult days ahead, everything from rescue efforts to new building codes and long term preventative planning resonates with the circumstances described in this article.